Thanksgiving is here! Yeah, I can’t believe it either. It’s been a busy month and December is almost upon us. This month, we’ve shared ideas for raising a thankful child, showing thankfulness in your home, and now we have ideas for creating memorable Thanksgiving traditions! Check out our ideas and then read Thanksgiving traditions that NFI staff share with their family. After you read our traditions, tell us yours in the comment section! Get Active: One of the things we often take for granted is our health and ability to engage in physical activity. Being active together as a family is a great way to create a memorable time together. You know you’re going to watch football at some point during the day. You also know you’re going to consume great portions of turkey and dessert. Consider getting outside and throwing the football during commercials or halftime to be little more active this year. You can always take a nap between games later! Get Creative: I’ve heard of families having their kids make handmade place cards for every person at the table or letting your kids act out a skit to say thanks to those who made the meal. The point here is to get creative and to get the whole family involved. Consider having everyone (parents and kids) draw a picture of the things they're thankful for this year and then post drawings in a high-traffic location. Make it competitive by offering two categories for best drawing awards; one for kids and one for the parents’. Get Alone: Okay, maybe this step is over-reaching, but if at all possible, try and get a moment to yourself…just to think! Yes, even if it’s only a few minutes, take time to reflect on what is truly important. Seriously consider the question: What do I have to be thankful for this year? If you can make this step happen, you’ll be ready to lead your family from a deeper perspective. Perhaps it’s your family’s tradition to spend a few minutes before or during the Thanksgiving meal to take turns sharing what you are thankful for or to express thanks for a specific person at the table. 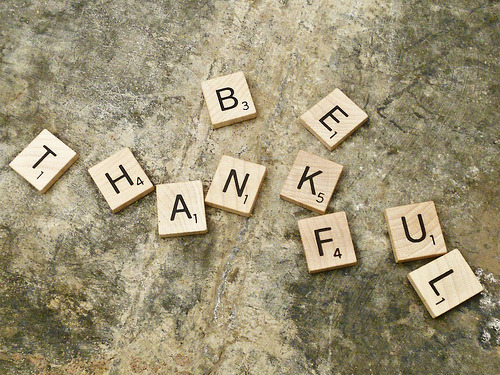 No matter your tradition, be sure you take time during all the busy schedules to be grateful! Get REALLY Traditional: There is no need to reinvent the wheel during the holidays. Keep it old school. You can learn a lot from your parents about traditions! What made the holidays special when you were a kid? Consider incorporating those traditions into your family’s list this year. Continuing traditions from the past is a great way to help connect your children with previous traditions that your kids may not have experienced. Get Your Mind Off Yourself: There’s no greater time than the holidays to consider ways you can serve and help others. Whether you spend time buying gifts or serving food, find a cause or opportunity to serve with your whole family. Serving as a family can make for a very memorable family tradition. NFI Staff Answers: What Makes a Memorable Thanksgiving? Now that you have five ideas for how to create meaningful family traditions, take a look at how some NFI staff answered the question, “What makes Thanksgiving memorable to your family? You can see by reading our staff traditions that creating memories means a lot of different things to different people! Whether it's the classic American festivities of food, football and movies, or something unique and special to your family, establishing traditions and creating memories are a great way to make the Thanksgiving holiday meaningful for you and your children. The most important part of the holidays is that you spend time together as a family. That's what will make the holidays memorable and special for your kids - time with you! What traditions make Thanksgiving memorable for your family? Visit our "Thanks, Dad!" page for more on how you can connect with your family and other dads just like you! Don't forget to say, "Thanks, Dad!" by recording a video, sharing a picture, or writing a short note on on this blog, Facebook or Twitter @TheFatherFactor. Use the hashtag #ThxDad to tell the world why the dad in your life deserves thanks!